We began this half term with a seaside day and a trip to The Deep to start our new topic 'Sea and Shore'. Back in class we did lots of work about different creatures that live in the sea and we explored some of the amazing things fish can do in a book called Fantastic Fish. 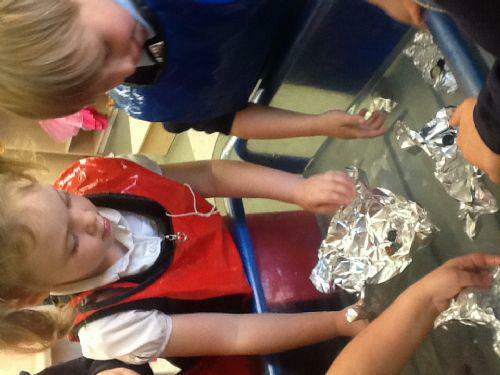 We also explored floating and sinking and made boats out of tin foil to carry buttons! In maths we practised addition and subtraction and began solving problems including doubling and halving. We even sorted numbers to 20 into odds and evens. We also explored flat (2d) and solid (3d) shapes describing them using mathematical words like sides, corners and faces. 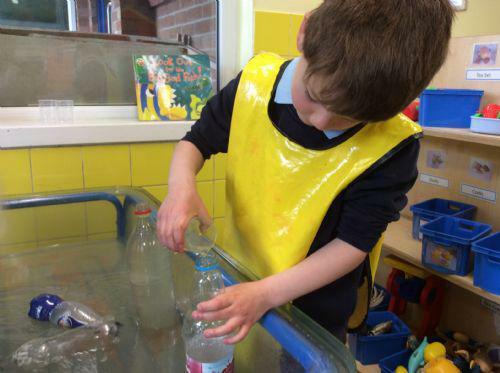 We also used the language of capacity when finding which container held the most. In English we shared stories such as Tiddler by Julia Donaldson and Rainbow Fish by Marcus Pfister. We wrote lists of fish and we wrote about the Rainbow Fish story. We also wrote our own under the sea stories. On Sports Day we took part in running and obstacle races and we explored moving like bees, planes, birds, rockets and kites from our Flutter and Fly project work. We have also completed a road safety unit of work which included discussions about holding hands when out and about, playing in a safe place and wearing a seatbelt. In PSHCE we explored relationships and our friendships. We learnt how to be a good friend and how to put things right when we have fallen out.